US Inflation Soars - Largest Rise in Producer Prices Since 1973! Martin Weiss writes: Suddenly and without warning, price inflation — long ignored and forever understated — has burst onto the American scene with the force of a cat-5 hurricane. The November jump in the U.S. Producer Price Index has exceeded the largest single-month rises of the Bush 2000s ... the Clinton '90s ... the Reagan '80s ... and even the Carter '70s. It's the worst bout of wholesale price inflation since the aftermath of the 1973 Arab oil embargo. It's the equivalent of over 38% inflation per year — a double-digit reading so high that not even the usual line-up of statistics-manipulating bureaucrats or double-talking politicians has dared come forward to spin the news. And it is here. Now! What's most remarkable, however, is the fact that, in the past, there was always an excuse. This time, there's none. In the past, whenever there was a surge in U.S. prices, it could always be blamed on a geopolitical event, an international cartel, or some other powerful force beyond our government's control. This time, it cannot be. Gasoline: Up a Shocking 34.8% ! Annualized Rate: Over 417% ! Consider the wholesale price of gasoline, for example. In the month of November, it wasn't up 5% or even 10%, either of which would have been shocking enough. Instead, it surged by a record-shattering 34.8%! And that's not an annualized pace of 100% or even 200%. It's over 417%! Back in 1980, for example, the largest one-month jump in the wholesale price of gasoline was in February, when the Iranian hostage crisis was reaching a crescendo and Iran was threatening to remove millions of barrels of oil from the world market. 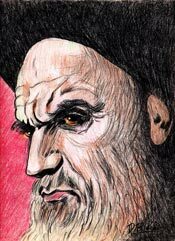 The image of Ayatollah Khomeini loomed large over Iranian society and over the world's oil markets, with a force and foreboding larger than George Orwell's Big Brother or today's Mahmoud Ahmadinejad. How much did U.S. wholesale gas prices rise? Just 6.8%. In 1990, a big gas price surge came in August. 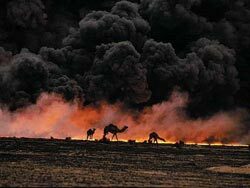 The obvious culprit: Saddam Hussein, who suddenly got the bright of idea of invading neighboring oil-rich Kuwait, plundering the country and setting afire thousands of the nation's oil wells. In 1999, the worst price surge came in April. And again, U.S. authorities could point fingers at an outside force: OPEC. At their March meeting in Vienna, the world's largest oil producers suddenly decided to cut production by two million barrels — and to maintain that lower level of output for a full year beginning in April. The metaphor for this momentous decision came on March 23, at exactly 4:26 PM Greenwich Mean Time. 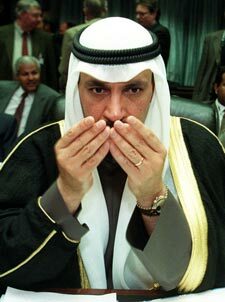 That's when Kuwait Oil Minister Sheikh Saud Nasser Al-Sabah stared into the press cameras, wiped his mustache, and signaled OPEC's determination to make a major impact on world oil markets. The wholesale price for gasoline in the U.S. surged by 28.8%. Today, we have no sweeping new revolution in Iran ... no sudden and unexpected invasion of an oil-rich country ... no big production cuts by OPEC. No. Today, what we have instead is precisely what we've been warning you about week after week: The biggest bout of the most shameless money-pumping we've seen in our lifetimes. This time, the leading culprit is the U.S. Federal Reserve. But they're not the only ones. Following their lead in the money-printing spree are also the central banks of Europe, Japan, China and India ... and in their footsteps, the central banks of emerging markets all around the world. This time, the primary force behind the surge in energy prices is the greatest, most flagrant violation of prudent monetary policy of modern times. And this time, the image that looms over the world's markets is not an ayatollah in Iran ... not burning oil fields in Kuwait ... and not OPEC ministers in Vienna. It's the visage of none other than Fed Chairman Ben Bernanke. February 1980: The Iran crisis drove U.S. wholesale gas prices up by 6.8%. August 1990: The Kuwait crisis drove gas prices up 17.1%. April 1990: The OPEC crisis drove gas prices up 28.8%. November 2007: The crisis created largely by the Federal Reserve itself has just driven gas prices up by more than all of the above: 34.8%! "The Fed has to take a stance. They can (A) target inflation aggressively and do their best to slay the beast, economic consequences be damned ... or (B) just admit they're trying to reflate the housing and mortgage markets ... that they don't care if that drives inflation higher in the short term ... and that they'll deal with prices later." Back in 1981 , the Fed was stepping in aggressively to tighten money and pushed interest rates up far higher than inflation. Result: The difference between the 30-year T-bond yield and producer price inflation was a robust 5.8% , paving the way for two decades of stable prices. It's pumping in so much money, it has artificially driven interest rates down far lower than the true inflation rate. Result: The difference between the 30-year T-bond yield and producer price inflation is a minus 2.6%, paving the way for years of surging prices . In his Thursday Money and Markets , " Fed Feeding Food Inflation ," Larry shows how this is driving the price of wheat, corn, soybeans and other commodities through the roof. And as Larry has stressed for many moons, it's not just food. It's "every natural resource under the sun." That means surging prices ahead for gold, silver, energy, construction materials, even water. It also means a wave of inflation the likes of which has not been seen since the 1970s. > a Fed that's desperate to push them down further. For you, that translates into the most unique threat to your financial well-being in at least three decades — and, at the same time, the most unique wealth-building opportunities of a lifetime. Listen to my audio posted on our website yesterday for my thoughts on how unprecedented this is. And stand by for our e-mails with more detailed instructions on what to do next.